Galaxy of artistes took part in the kick off of the Yudala Zero Gravity in Lagos on Sunday, reports ITRealms. These artistes included Olamide, Naeto C, Sound Sultan, Humblesmith, Zoro and David Grey among others. 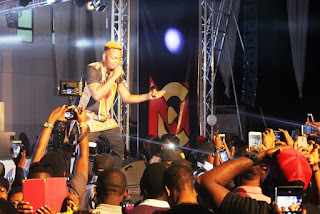 Yudala Zero Gravity, ITRealms reports is a multi city digital entertainment concert powered by composite e-commerce outfit Yudala – kicked off with a mega music blast at the Landmark Centre, Oniru on Sunday October 2nd. In addition to a keenly contested dance competition, Ace comedian and joint compere Ali Baba was also hand to treat the audience to a repertoire of rib-cracking jokes from his collection. The well-attended event had a number of dignitaries including bank CEOs, Chief Executives and captains of industries in attendance as well as a number of corporate organizations represented, including Hewlett Packard, Airtel, Access Bank, Stanbic Bank, Hennesy, DigitalSENSE Africa Media, Kia Motors, Uber. The event was also covered extensively by major media establishments such as MTV Base, Trace TV, among many others. In his closing address at the event, Founder /Vice President, Yudala Limited, Prince Nnamdi Ekeh was effusive in his appreciation for Yudala customers and the numerous partners for their support. “I wish to express my heart-felt gratitude to our customers. Without you, we wouldn’t be here today. I also wish to recognize the likes of Airtel and Access Bank who have partnered with us from day one and in our various programmes such as YUBOSS. “This event would also have been impossible without the support of Hewlett Packard (HP). We say a big thank you! “I am also grateful to Stanbic Bank, Kia Motors, Uber and our media partners: MTV Base, Trace TV, Urban FM plus our online media friends including Linda Ikeji’s Blog and many others too numerous to mention here. “Yudala is a movement – there is no other e-commerce company that can put together an event such as this to appreciate its customers and partners. I urge you to stay hooked to Yudala online and offline as we have an ambition to become the biggest e-commerce company on the continent. Within a year of launch, we have broken all existing records and rolled out over 18 stores nationwide. But this is just the beginning as there is still many more to come from us,” he enthused. The Yudala Zero Gravity trains moves on to the city of Abuja with a Contemporary Music Blast on October 21st and a Rock Gospel Concert on October 22nd while the city of Enugu will rock on November 5th and 6th with a Contemporary Music Blast and Rock Gospel Concert respectively. “I hope to see you all in Abuja and Enugu for the dual concerts. Also, I personally invite you all to the Federal Palace Hotel in Lagos on November 20th for the Rock Gospel Concert which marks the grand finale of Yudala Zero Gravity. It’s a day on which we will all be blessed,” concluded Prince Ekeh.